This page covers the author of Moneyball: The Art of Winning an Unfair Game. For other authors named Michael Lewis, see the disambiguation page. 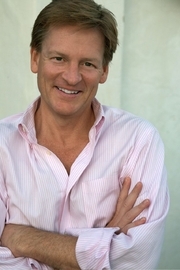 Michael Lewis has 4 media appearances. Michael Lewis discusses The Big Short: Inside the Doomsday Machine. Michael Lewis discusses Moneyball: The Art of Winning an Unfair Game. Author of The Big Short, Boomerang, and Liar’s Poker, successful and succinct investigative reports of Wall Street and the financial crisis, Michael Lewis is perhaps the best-known, most influential financial journalist of our time. His latest book, Flash Boys: A Wall Street Revolt, uncovers the “rigged” system of equity trading. Lewis is also a keen observer of human instinct, determination and compassion, so skillfully brought to life in his personal tributes The Blind Side and Coach; and with great humor in his reflections on parenting, Home Game: An Accidental Guide to Fatherhood. In this fireside chat moderated by Katherine Dinh, Head of Prospect Sierra School, Lewis will share childhood memories, discuss his work and field questions from the assembly. “An Intimate & Irreverent Evening with Michael Lewis” is a benefit for the tuition assistance program at Prospect Sierra School, where Michael Lewis and his wife Tabitha Soren’s children attend. Click here to purchase your ticket(s)! City Arts and Lectures presents Michael Lewis discussing his latest work, Flash boys: A Wall Street Revolt, in conversation with Tabitha Soren. Michael Lewis, bestselling and award winning author of Moneyball, The Blind Side, and The Big Short, returns to the financial world with Flash boys, (W.W. Norton, $27.95) a new book that gives readers a ringside seat as the biggest story in years prepares to hit Wall Street. Lewis will be in conversation with Andrew Sullivan of The Dish. This event is part of THE NEWSMAKERS SERIES, a partnership of Politics & Prose and GW Lisner, that moves beyond the headlines to spark in-depth conversations about contemporary issues. Online sales end at noon. Tickets will be available at the door. All books and tickets will be available at will-call 6 p.m. the day of the event. P&P will not have books or tickets available for pick up prior to the evening of the event. The author of eighteen books, Frank Deford has worked in virtually every medium. He is senior contributing writer at Sports Illustrated, where his byline first appeared in 1962. A weekly commentator for NPR's "Morning Edition," he is also a regular correspondent on the HBO show "Real Sports with Bryant Gumbel." As a journalist, Deford has won the National Magazine Award for profiles, and has been elected to the Hall of Fame of the National Association of Sportscasters and Sportswriters. Voted by his peers as U.S. Sportswriter of the Year six times, he was also cited by The American Journalism Review as the nation's finest sportswriter and was twice voted Magazine Writer of the Year by the Washington Journalism Review. He has been presented with a Christopher Award and awards for distinguished service to journalism from the University of Missouri and Northeastern University. Deford and Red Smith are the only authors with more than one piece in The Best American Sportswriting of the Century, edited by David Halberstam. For his radio and TV work, Deford has won both an Emmy and a George Foster Peabody Award. Bill Littlefield has been the host of the syndicated National Public Radio sports show Only a Game since 1993. He teaches a course in the Humanities Division at Curry College in Milton, Massachusetts, where he also serves as writer-in-residence. Littlefield is the author of several books, including Baseball Days and Champions: Stories of Ten Remarkable Athletes. PLEASE NOTE: This event is a SIGNING ONLY. In order to join the signing line you must purchase a paperback edition of I Beat the Odds from BookPeople. Oher will sign only his books at this event. The football star made famous in the hit book and film THE BLIND SIDE reflects on how far he has come from the circumstances of his youth. Michael Oher shares his personal account of his story, in this inspirational New York Times bestseller. RSVP on Facebook In order to have anything signed at a BookPeople event, a copy of the event book must be purchased from BookPeople. If you purchase your book from BookPeople in advance of the event, please save your receipt and present it at the event. Thank you for supporting Michael Oher, and your local independent bookstore! Michael Lewis , The Big Short: Inside the Doomsday Machine.